Google has officially taken the wraps off the long-awaited sequel to last year’s Nexus 7 tablet, and with the previous model celebrated for its high-end array of specs for a modest price point, the new Nexus 7 is equally as impressive. Packing in a Qualcomm Snapdragon S4 Pro CPU clocked at 1.5GHz, 2GB of RAM and a mightily sharp 1920 x 1200 display, the new Nexus 7 is a worthy successor to one of the mobile industry’s most popular slates, and we’ve got all the rest of the details coming up for you right after the break. 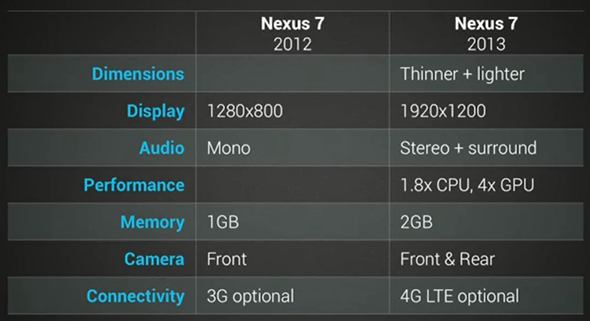 There’s no doubt that, on a 7-inch display, a 1920 x 1200 resolution is going to look fantastic, and although we’ll obviously have to wait for a hands-on to discover whether colors, contrast and viewing angles are up to scratch, it’s unlikely we’re going to be seeing any pixels with the new Nexus 7 and its 323 ppi display. The new Nexus 7 represents colors more accurately as well, up to 30% more accurate than the previous gen Nexus 7 tablet. Under the hood, as Google used to say quite frequently, is a quad-core Snapdragon S4 Pro, which is clocked at 1.5GHz. This is, as many of you will be aware, the same processor as the popular Nexus 4 smartphone, and although some reports had suggested the new Nexus 7 could pack as much as 4GB of RAM within, it once again follows its LG-made smartphone counterpart with a healthy 2 gigs of RAM. The new Nexus 7 is 2mm thinner than the previous Nexus 7, but that’s not all, even the bezel is 2.75mm thinner than the previous gen tablet. The device is now 6mm narrower, and here comes the best part: it’s 50 grams lighter! In a sense, this new Nexus tablet is very much an extension of the Nexus 4, with many striking similarities throughout its makeup. Same processor, same amount of RAM, and same relatively strong list of hardware specs. This isn’t necessarily a bad thing, but if you do own a Nexus 4, you’ll probably be wondering what incentive you have to actually go out and pick one of these up; save the larger display. Those who are really into music will be pleased to know that the new Nexus 7 ships with stereo speakers, one on each side, so that you get a better feel of your content. The device will have standard Wi-Fi (802.11 a/b/g/n) support, Bluetooth 4.0, HDMI output, and for US customers, Google will ship a 4G LTE model, which will be fully unlocked and will be available on AT&T, Verizon and T-Mobile. The new Nexus 7 does pack in NFC, and while the RAM count mightn’t have lived up to the billing, there is the as-rumored rear-facing 5-megapixel camera. Although we’re not expecting high levels of performance ability from the rear shooter, at least the option is now there, allowing Instagram fans to be as snap-happy as they like without having to compromise. Last but not the least, the new Nexus 7 features wireless charging and is compatible with any Qi Standard charger. That’s a big plus. 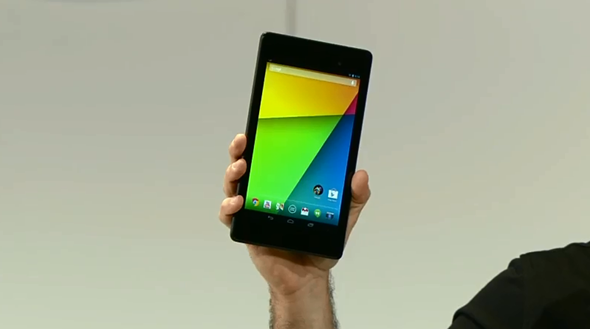 The new Nexus 7 features 9 hours of battery life for HD video playback, and 10 hours while surfing the web. As we suspected, Android 4.3 Jelly Bean arrives on the device as stock, and we’ll be covering the software in more detail in a separate post. UPDATE: Here’s what’s new in Android 4.3 Jelly Bean. As far as pricing goes: the 16GB variant of the famed tablet will ship for $229, while the 32GB model will sell for $269. The devices will be available via the Google Play Store, and will be available via different retail channels in the US. The 16GB and 32GB Wi-Fi models will be available from Google Play starting next Tuesday. The 32GB model with LTE will be available for $349, and will be available in the ‘coming weeks’. 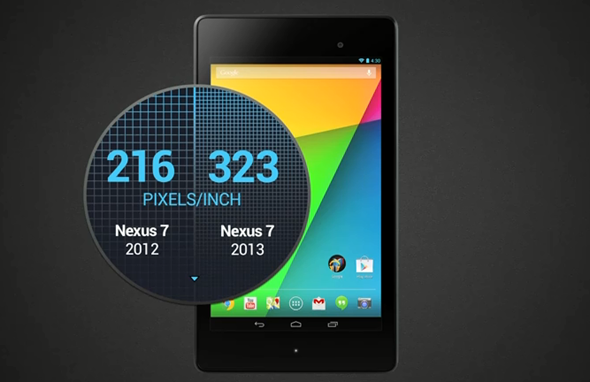 What do you think of the new Nexus 7? Does it live up to your expectations, or will you pass on what is essentially a tablified Nexus 4? Do share your thoughts and comments below!